Johann Sebastian Bach. Very Good. In very good packaging. J.S. 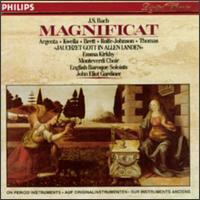 Bach / Kirkby / Gardiner-Magnificat BWV243 / Kantate Bw51 by J.S. Bach / Kirkby / Gardiner. Very Good. Perfect disk surface with no scuffs or scratches. In lightly scuffed jewel case with liner notes. (Shelf location: W2D) All items carefully packed to avoid damage from moisture and rough handling. Tracking included. Like New. Original 1985 Philips release, 411 458-2. Made in West Germany. Matrix code 411 458-2 01 AA. Disc, original artwork, and case are all in great condition. A couple small light marks to surface. Free upgrade to First-Class USPS shipping in the US. Satisfaction Guaranteed!